(CBS) - Watch out Ashton Kutcher. Another Hollywood heartthrob is making waves in the tech world. 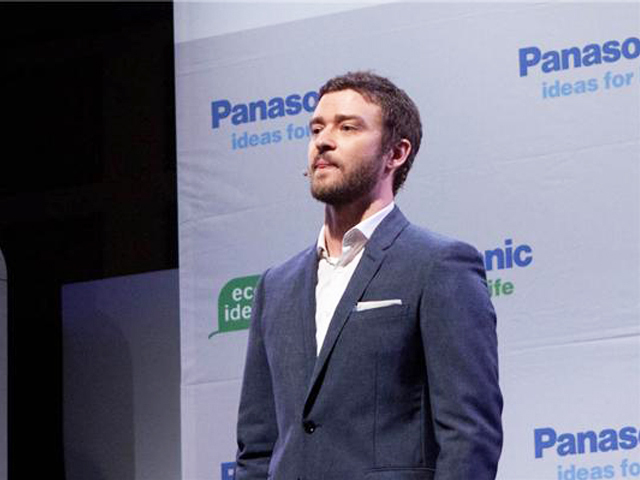 Justin Timberlake made an appearance at Panasonic's press conference Monday to plug a joint venture between the hardware manufacturer and MySpaceTV. MySpace's new owners, Specific Media and Justin Timberlake, unveiled the partnership at the 2012 International Consumer Electronics Show. "We're ready to take television and entertainment to the next step by upgrading it to the social networking experience," Timberlake said at the press conference. "Why text or email your friends to talk about your favorite programs after they've aired when you could be sharing the experience with real-time interactivity from anywhere across the globe?" The idea is to integrate the experience of watching TV with social media, so that you can invite friends to view the same show and make comments using a combination of the social network, TV sets and mobile apps. One way to think of it would be like Hulu and Netflix with social networking. "As the plot of your favorite drama unfolds, the joke of your favorite SNL character plays, or even the last second shot of your favorite team swishes the net, we're giving you the opportunity to connect your friends to your moments as they're actually occurring," Timberlake continued. "This is the evolution of one of our greatest inventions, the television. And, we no longer have to crowd around the same one to experience it together." Can Timberlake breathe new life into MySpace and shake its reputation as a has-been brand? It may depend on whether or not they hired a team of talented developers to update and launch a totally new product. MySpaceTV will launch in the first half of 2012 and is currently taking names of people who want to get an invitation for early access.